Dr. Stuart Terry is the Medical Director of TLC Laser Eye Centers in San Antonio, Texas and a member of Braverman-Terry-Oei Eye Associates. Since graduating as valedictorian from the University of Illinois College of Medicine in 1968, Dr. Terry has continued to distinguish himself both academically and professionally. He completed his residency in ophthalmology at the Washington University School of Medicine in St. Louis, Missouri. While in the U.S. Air Force, Dr. Terry pursued a career in research, teaching and clinical practice with interests in refractive surgery, cataract surgery and the treatment of glaucoma. Dr. Terry has been distinguished as a VISX Star Surgeon, an honor given to the top five percent of refractive surgeons nationwide. He is certified by the American Board of Ophthalmology and in Cataract Surgery and LASIK by the American College of Eye Surgeons. 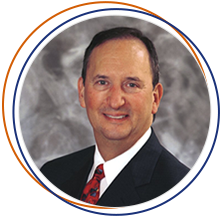 Dr. Terry is a Clinical Professor of Ophthalmology at the University of Texas Health Science Center in San Antonio. He is the former Chairman of the Department of Ophthalmology, and is a Fellow of the American College of Surgeons. Dr. Terry has published numerous scientific papers, lectured to professional colleagues throughout the country, and conducted scientific research on the treatment of various eye conditions. Dr. Terry has dedicated his career to helping the public achieve freedom from visual problems. Dr. Terry has been recognized by his peers as one of “The Best Doctors In America” and has received the “Honor Award” from the American Academy of Ophthalmology.